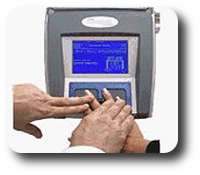 Live Scan is an ink less electronic fingerprinting method. The fingerprints are electronically transmitted to the Illinois State Police and/or the FBI for completion of a criminal record check. The Live Scan technology replaces the process of recording fingerprint patterns through a rolling process using ink. Digitizing the fingerprint images enables them to be transmitted electronically to the ISP/FBI in a matter of seconds. Our agency is a duly authorized Illinois State Police and FBI certified fingerprinting service provider to electronically capture and submit fingerprints for licensure, certification, volunteer, job, business permit, record review, or licenses and /or employment purposes. We use the latest digital scanner technology to provide live scan fingerprint submissions. This assures you of the fastest and most reliable service with the best price.